Some of the greatest percussionists in contemporary jazz pay tribute to the undisputed master of the drums, Buddy Rich, in this concert video recorded during a special benefit performance on October 14, 1989. The Buddy Rich Memorial Scholarship Concert, Vol. 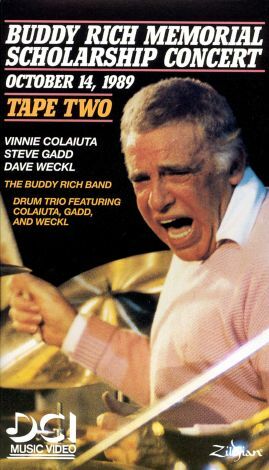 2 features Steve Gadd, Dave Weckl, and Vinnie Colaiuta performing with the Buddy Rich Orchestra on some of the great man's best known songs.